Termites feed on wood and don’t need to sleep. They can bite everything made out of wood, including your house, and furniture. If they start feeding from your house support beam, it can bring serious damage to it. The average termite queen can lay an egg every 15 seconds, so you can imagine how fast they can multiply. As soon as you discover any bite marks in your furniture or walls, you should contact a termite control company as quickly as possible. A single colony of termites is capable of eating up to one thousand pounds of wood each year, so imagine how much damage they can do to your house in a single day. Varsity Termite and Pest Control in Gilbert is a termite control company with more than twenty years of experience in dealing with termite pest control. Our positive reviews in Google reviews, Yelp and our A+ in Better Business Bureau shows how involved we are in everything related to Gilbert pest control. If you need someone to do a house inspection for any sign of infestation thoroughly, you can give us a quick call to coordinate where and when to go. As an honest and reliable Gilbert termite control company, we understand how important your home is to you. Our products are organic and non-toxic, meaning that it is safe for pets and kids, and won’t do damage to your plants in your backyard. 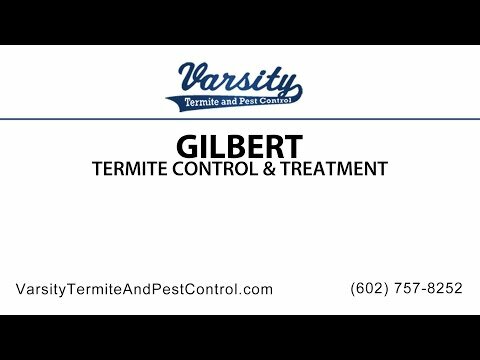 Are you in the Gilbert area and need help with a termite problem? Look no further than Varsity Termite and Pest control. We have been helping the residents of Gilbert eliminate termites in their home or business of over 21 years. Varsity Termite and pest control is a family owned and operated company that builds our business through superior customer service and effective termite inspections and treatments. Termites can burrough into the wood of your home and destroy your property. But with proper inspections and early detection, Varsity Termite and Pest control can eradicate your termite problem in minutes. Don’t wait for a problem, stop them before they start. Call us at 602/757/8252 or visit us online at varsitytermiteandpestcontrol.com, today. It has been said that there are only two types of homes in Az., those that have termite problems and those that will. But does your property have to experience termite damage or be targeted for termite control in Gilbert? Gilbert homes and businesses are being slowly eaten away by more than just the wind, rain and other elements. Before human settlements arrived in the Phoenix valley and Gilbert, thousands of termites survived on the Desert floor. Termites thrive when provided with a source of moisture, shelter from the hot desert sun and an endless supply of fresh food … your home! With the influx of the human population, termite infestations in Gilbert are an every day occurrence. With over 65,000 households in Gilbert alone, termites have a limitless supply of fresh food for years to come. To avoid becoming a property damage statistic, it is wise to call in a Gilbert pest and termite control company to carry out a termite inspection. Make no mistake, Even though, they’re tiny, termites can and do cause major structural damage. Their sheer numbers, well into the millions per nest, plus their diet is what can cause concern among property owners. There are thousands of species of termites, and only 10% of them are considered pests as such and warrant a call to your local Gilbert exterminator. In fact, in the tropics some termites actually serve a vital ecological purpose. Termites are detrivores, which means that they eat debris and recycle decomposing materials as nutrients that enrich the soil. Termites that build nests near your home, however, are something to really be worried about. Let’s say your house has virtually no wood in its construction, so you are not worried about termites.} Unfortunately, it is not that simple. In an ideal world, termites would only eat one variety of wood, and we could build our buildings appropriately. All one would have to do is build their home out of materials that termites wouldn’t want to eat. Termites don’t confine their diet to just wood however; they also can eat plastics, paint, and silicone adhesives. While termites may or may not eat each of these materials, they have been proven to take pieces of them to build nests with. The aftermath of an infestation of termites is ultimately damage to wooden structures. As they relentlessly eat away at wood and wooden products, they can cause entire structures to collapse. Obviously by the time this happens, it’s already too late. It is a far better idea to get on the phone to Gilbert termite exterminator and have a termite inspection done to stop the problem before it exacerbates. Varsity Termite and Pest Control is proud to bring you the best pest control service at affordable prices. We will make your pest infestation wish they never invaded your house in the first place. Contact us today to start your personalized pest control treatment plan. In Gilbert, we are the termite pest control company that promises the quickest response to deal with your Termite pests. Termites can live in dark places between your walls or underground in your backyard. It doesn’t matter where they locate in your home; we guarantee that we will deal with them in a thorough manner. Varsity Termite and Pest Control not only deals with termites but also with nasty scorpions. They can be so small that they can access any room or space in your home that is not properly sealed. As a professional pest control company, we guarantee to prevent them from coming back uninvited with our scorpion home sealing. Which Costs More? Termite Control in Gilbert, Or Repairing Termite Damage? Because of the level of damage they can cause, termites can be a dangerous and costly pest. In one notable case in India, they literally consumed $4,000. Termites generally don’t infest the Arctic, they prefer the same temperate latitudes that we do. Termites damage approximately half a million homes in the U.S. each year, and cost anywhere from two to five billion dollars each year in either repair costs for the damage that they’ve caused or in costs to control them. Termite hives often have termites in the millions, and produce methane, a known greenhouse gas.